Log Stores & Your Wood . It is important that you choose the correct wood for burning in your wood burner stove or open fire and that they are stored correctly. You should always burn dried (seasoned) wood, either by purchasing it dry, or purchasing green logs which need seasoning for at least a year before they can be used. Remember, wood burner stoves achieve significantly higher efficiencies than open fires, 70%, and provide an attractive, renewable and low carbon heat source which is relatively cheap to run. Smoke Control Areas – logs and most wood briquettes are not approved for use in smoke control areasexcept when using an officially approved “exempt appliance” – i.e. DEFRA appliances. You can find out the list of Smoke Control Areas, along with approved appliances at www.uksmokecontrolareas.co.uk. 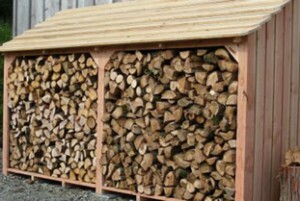 At The Kent Log Burner Company we are more than happy to advise you on how to store your logs and even design and build a log store to your own requirements. You can also visit the Foresty Commission for further information on using wood as fuel. Alternatively you can contact us and we will be more than happy to provide any further information.